What is a When is a Why is a Wine Fair? When we say ‘Wine Fair,’ what we mean is a big room in somewhere like Stromness Town Hall or Sandwick Hall. There may be one or two tables with local producer’s food to sample, maybe some cheese, maybe a spirits company. But the defining feature is half a dozen or so tables around the hall, each with six of seven different wines on display - and open for tasting. You grab a glass, and slowly progress around the room, tasting whatever you are interested in, making a few notes as you go along, and taking the chance to ask the winemaker or merchant behind the table any questions you may have. Discuss with your friends or just sip in silence, the choice is yours! We usually arrange a pre-Christmas wine fair in both Stromness and Kirkwall in mid-November - an ideal to find some treats for the festive season. And we always have a wine fair as part of the Orkney Wine Festival in May. 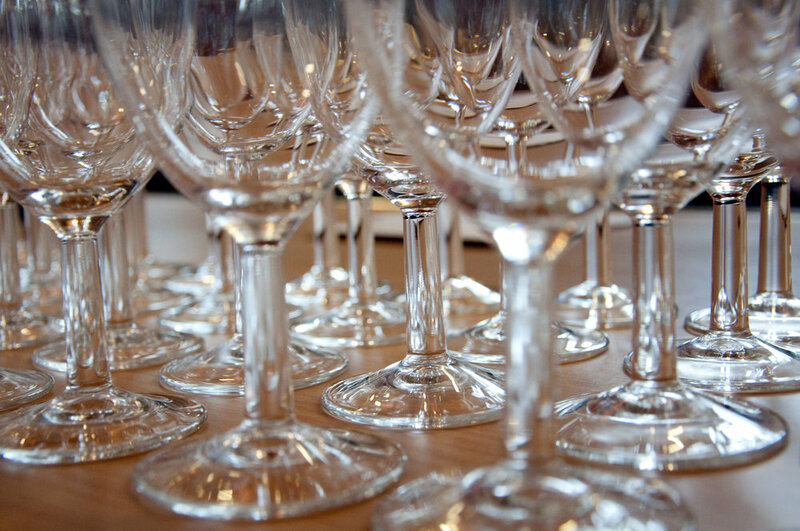 We’re happy to announce today that this year’s festival wine fair will be on Saturday 11th May in Kirkwall Town Hall. To give you a flavour of what to expect, we though we’d let you read Duncan’s tasting notes from the 2018 Christmas wine fairs. Every bottle tasted, considered and honestly described! The line up won’t be the same in May, buy this should give you some idea of the range of wines available at our events. We usually charge about £10 - amazing value! NB These descriptions, vintages and prices were correct in November 2018. Since then importers have released their new prices, and duty in alcohol has increased - so the prices may be slightly out of date . But we will leave them in as a guide to roughly what the cost of each wine is - even if some may by now be 20p or 50p dearer. Still our best-selling Prosecco, in its unique swing-top bottle. Crisp, dry, delicious. Perfect Prosecco: spritzy, fresh, with a prickle of acidity. Top-notch Brut Champagne: rich and full of flavour. 60% Pinot Noir, 40% Chardonnay, so nice and fruity. We're able to pass on a great discount on this - make the most of it! Initially there’s a nip of acidity, but it’s quickly followed by rounded fruit on the mid-palate. Then funky flavours of orchard fruit and fresh bread start to come through. Complex and very long. Exciting to drink now but could age and mellow well for five years or so. New to us: an unusual wine from Northern Italy: beautifully perfumed, slightly sweet, gently sparkling, low in alcohol. Drink by itself or with fruity puddings or cakes. Ooh, this is much sweeter than I remembered. Dark pink in colour. Gently sparkling – frizzante as the Italians say. Lovely cherry aromas, rather than the strawberry ones that Moscato usually gives. Probably too sweet to drink by itself, but this would be fantastic with cake or fruit puddings like pavlova or trifle. Light and peachy, with just a whisper of sweetness. A good all round rose for drinking by itself or with light pasta and fish dishes. Ah, now we are getting some strawberry aromas. This is for folk who prefer a touch of sweetness in their rosé. Not bad at all…but I’m expecting No 5 will be more to my personal taste. Another excellent new addition to our range, brought in for a Lynnfield Lux and a great success since. A lot fuller bodied. Try with smoked salmon, seafood or paella. And it is! Wow, this is lovely. Salmon pink in colour, and with strawberry aromas not a million miles away from No 4. But this is drier and fresher, and with a much fuller body. One of the most impressive rosés I’ve had for years. Brand new. Moscatel is beautifully scented, and in this version has delicate sweetness and a balancing zing. Good with lemon tart or creamy blue cheese. Wow. I was wrong to say this had ‘delicate sweetness’ – actually it’s extremely sweet, a real full-on dessert wine. What I had also forgotten was the beautifully creamy texture. Fantastic aromas characteristic of Moscatel: somewhere between exotic flowers and tropical fruit! This would be great with lemon tart, creamy puddings like trifle – or instead of pudding! I reckon it would be good with soft blue cheese too, and – surprise of the night – it even complemented Hume’s smoked mackerel pate. I think the creaminess of the wine matched the texture of the pate, and saltiness of the fish balanced out the sweetness of the wine. Our best-selling Port since we launched it this time last year. An absolute classic style, and with a very good price just now. Bullseye. This is exactly what I want out of a port: deep dark purple in colour, intense fruity flavours, and a lick of fieriness on the finish. Rich, sweet and very smooth. We have a full range of dry and medium sherries as well - but this just shouts Christmas! This is a lot nuttier and tangier than I remembered. Yes, it is sweet, but not very sweet like a Pedro Ximenez, and it doesn’t have PX’s dried fruit flavours either. An excellent example of a semi-sweet sherry. Pow! Zap! Zing! Crisp and apply Pinot Grigio, just like that. I was right on the crisp and apply, but the pow/zap/zing was overstated. Actually, this came over on the night as a ‘quiet’ white wine, not assertive in its flavours, just gently lemony, gently apply. My tastes are for something more characterful, but this is a decent all-round white. Wow, this is great! There’s a touch of sweetness, but that is balanced by GV’s characteristic acidity (its green-ness.) The flavour is delicious – something like lemon meringue pie, or maybe key lime pie. But it isn’t a dessert wine, far from it. This would be great with a nice bit of fish and a lemon wedge. Delicious by itself too. One of the most impressive wines on show tonight. The first time we've featured an English wine at our wine fairs. It’s crisp and lemony, a great fish wine. Or try with Godminster cheddar. The bottle we opened in Stromness on Friday had an off-putting aroma at first – something like boiled cabbage. The wine tasted decent enough, but the aroma was verging on the unpleasant. Saturday’s bottle had a much cleaner, fresher, fruitier nose, which matched the clean, lemony palate. Thinking on the differences between the two, I feel that Friday’s bottle was suffering from a fault called reduction. Probably the most common wine fault (invariably with bottles sealed with corks) is oxidisation, where air has leaked in (often due to a dried-out cork) and spoiled the wine, giving it a brassy, sherried aroma and unpleasant, metallic flavour. Reduction is the opposite: it’s where the wine has access to too little air as it matures. Whether or not it is more common in screwcap-sealed wines than cork-sealed wines is a matter of debate – for instance here: https://www.jancisrobinson.com/articles/screwcaps-and-reduction-in-wine. I should have spotted the fault on Friday, but faults in screwcap wines are so extremely rare that I just forgot to consider this as an explanation. Poor Stopham Estates! Especially on a day when their Pinot Gris (which we also stock) won a major award. Wow, this has an amazing aroma…as if Chanel No 5 was made of grapes. Very attractive. So what’s it like when you take a sip? It’s lively, with a zing to balance the fairly full body. The flavours really linger. This is the first time we’ve shown this wine at a tasting, and it’s a find. A good aperitif or would match spicy dishes like Thai green curry. A stunning balance of minerality and fruit. A dry Riesling that is amazing with crab and other seafood. Let’s compare two Sauvignon Blancs: this one from the grape's heartland in the Loire Valley, and the next from its new home in New Zealand. Wally’s Sauv Blanc has been on our shelves for years but I rarely try it – in fact I probably taste their Chenin Blanc more often. So what’s it like tonight? Hmmm…nice Sauv Blanc aromas, not over the top, but unmistakable. It’s quite complex actually: an affordable alternative to its near neighbours Sancerre and Pouilly Fume. I should have this more often! This IS over the top! Amazingly bold aromas of melon and other tropical fruit. Over-ripe pineapple, is that possible? But something green and grassy too. Quite a fruit cocktail! It’s not sweet like ripe fruit, though, it’s dry. The final impression is of quite a simple wine (compared to the Wally) but one that has all the characteristics we enjoy in Marlborough SB. Buckets of bright fruit from the famous Mas de Daumas Gassac in the Languedoc. A great all-rounder. This is a wine we used to stock, but as it’s from an importer we don’t often buy for, we haven’t had it for a year or two. We should have – it’s great! Buckets of tropical fruit, and a bright finish. Drink by itself or with fish or many light dishes. Amazing value. A relatively simple wine, and not one that jumps out of the glass at you like the Moulin de Gassac, but very well made and easy-drinking. Good value for money. A great favourite of some of our customers - quiet right too! Loads or aromatics from the Viognier, and extra body from the Chenin. A unique but delicious combo. The first of two Chardonnay-based wines, this is a great quality Chablis from a small family producer at a steal of a price. Cool, collected, classy. Just a touch of oak. Generally I love this wine, but I think it is too subtle to stand out amongst so many other exuberant wines. Better to savour it in quieter surroundings. An old favourite, as good as ever. A unique blend of four grapes, it's aged in oak with the result being bid, bold and complex. Organic. My nose must be attuned to oak now, because that’s what I detect here, with the complex zesty fruit following on. Usually my impressions are the other way around. A blend of Sauvignon Blanc, Chardonnay, Chenin Blanc and Semillon. Unique and delicious. A layer of flavours I should have mentioned was lime – there’s lots of it here! Discovered on a trip to Portugal last year. Encruzado is the (very obscure) grape, and the style is rich, complex, slightly oaky - but with delicate floral notes too. Something special. This is maybe the strangest wine here tonight. It has a brassy aroma which suggests some oxidisation, which is a style this winery goes for sometimes. It’s surprising at first, but it does add complexity to the wine, which also has layers of orchard fruit (baked apples? ), herbs and oak. A strange but fascinating wine. Not one to sip casually in front of the telly – at its best with baked cod in a creamy sauce or even roast pork with apple sauce! Amazing value! A warm and slightly spicy red from the sunny south of France. Mostly earthy Grenache with a splash of fruity Syrah. Light purple in colour, loads of fruit, a bit of tannin. Relatively simple, but who cares! Great value. Gamay is the grape behind Beaujolais, and this is as light and juicy as you’d expect. Great by itself and a real red-contender for turkey-time. Vibrant purple in the glass. It is indeed reminiscent of a Beaujolais: very fruity and juicy, with very little tannin. Folk who prefer big, bold, powerful wines may not go for this one, but it’s a perfect example of a light, fruity red – I love it! Purple like a damson plum. The flavours are plummy too. A simple wine, but a very enjoyable one. Wow, what great value for a classic Italian red: warming, peppery, with a nip of acidity. Fantastic with full-bodied pasta dishes, pizza and red meat. Grab a cube of Gavin's/Hume’s cheese to try with this! Darker purple. Much fuller bodied. The most ‘serious’ of the reds so far – layers of flavour gradually revealing themselves, rather than just one simple sensation. It has a bit of that characteristic Italian ‘tang’ of acidity – which will make it great with red meat but also tomato-based sauces on pasta or on pizza. Yes, a classic Italian red. Another great bargain. Many Malbecs are big and jammy, but this one manages to be full of flavour but relatively light in body. Bright purple in colour. Lovely on the palate: flavours of blackcurrants and brambles, and a smooth finish. Great value for money – the best quality Malbec I know for under a tenner. We can do a special deal on this one…one of Duncan's favourite wineries from his visit to NZ last year. It's the same grape but a mile away from Aussie Shiraz (see below) - medium bodied and berryish. Immediate strong aromas of violets! Not what I expected. Well, hints violet can often be found in Syrah or Shiraz, especially from the Northern Rhone, but rarely do you find a red wine as floral as this. Almost like perfume! There’s a good structure. It’s seductive and lovely once you get your head around the violets and start to discern the underlying raspberry fruit. Speaking of Oz, here is a cracking Pinot from one of its cool-climate homelands in beautiful Yarra Valley. Duncan visited this winery 11 years ago and had a memory like an elephant…a wine-loving elephant. Ah, this is very classy! A nose that balances dark berries with freshly-dug black earth. A palate that is relatively light but with persistent flavours. You know what you’re paying for here: a wine of real intensity, but delicacy too. Drink with cold meat, or roast chicken, or cheese. Or by itself. One of the world’s leading organic producers, Adobe offer great quality across their range, and great value too – as this fruity/earthy Pinot demonstrates. Very light in colour, yet much fuller and sweeter than the Giant Steps. Another good value tasty wine from Adobe. The best Cotes du Rhone we've tasted - so good we imported it direct from Châteauneuf-du-Pape. A great vintage and excellent value. Loads of fruit, just a little oak flavour. Amazing, what a great wine for a tenner. From selected vineyards around a single village rather than the broader Rhone area, this has great intensity of dark-fruit flavour and a full body. 80% Grenache, 20% Syrah. Wow! Sweet oak the initial impression, then buckets of fruit come sloshing in. No 31 is a great light Cotes du Rhone, but you are definitely getting your money’s worth by spending a wee but extra for this. Would work well with any full-flavoured dish, but the oak/fruit combo makes it attractive to drink by itself too. Top-notch Rioja - a great balance of raspberry fruit and sweet vanilla oaky. An old favourite: good Rioja never lets you down. A turkey contender? Another wine that benefits from the sweet kiss of new oak barrels. This is light to medium bodied, and I should probably have made it No 31 or 32, as it’s a bit overwhelmed coming immediately after the Seguret. Definitely an excellent Rioja though. And yes, turkey! We're still in Spain but up NE near the French border, Garnacha-land. Here the grapes grow ripe and rich, and the wine follows suit. Powerful but smooth. Wow, another stunner! (The ‘big reds’ table is always impressive.) It’s full bodied and packed with flavour: black fruits and berries, and an earthiness that I often get from Grenache/ Garnacha. 15% alcohol! But overall it still feels balanced, because of the copious fruit and good structure enveloping the alcohol. Ah, down a step in terms of power and complexity: this is relatively simple but very pleasurable. Dark, loads of fruit, good with food or by itself – and amazing value. Unfair to compare this to the wines on either side, really, as it’s half the price: of course it’s a bit less complex. Still delicious though. A great party wine. Barossa Valley, along with McLaren Vale, is the best area in Australia for big bold reds. This is a fantastic example and will provide a fascinating contrast with the cheaper Seriti - is it worth the extra £6? Back to a full, complex body, and lots of super-ripe fruit as you’d expect from the Barossa Valley. Very good. Can’t read my own writing here! ‘Quite splished’ – what does that mean? New to our shelves, fruity Valpolicella is 're-passed' through Amarone barrels to produce a fantastically dark and intense wine. Smooth, ripe, rich, but with that characteristic Italian bite that makes it an excellent food wine. (Wrongly priced on the night at £6,99 / £6.00! Congratulations to the many people who tried it, loved it, and ordered it at £6 – you got the best bargain of the night! I’m sorry to say I was so busy tasting the wine that I never got round to the whisky table. I heard great reports though! (The Tomatin was the most popular sales-wise, with the Bunnahabhain not far behind.) 37 wines were a lot to try, and three whiskies on top would have been just too much of a good thing. Tasters, know your limits! Orkney Wine Festival 2019: full details released!